For Steel Pier Foundation Repair, Call HD Foundations. 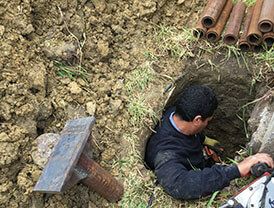 Pressed Steel Pilings Are a Good Method of Repair. For steel pier foundation repair in the DFW metroplex, contact HD Foundations. 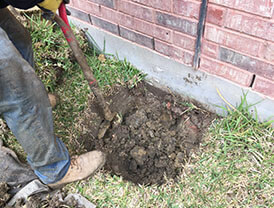 We offer free estimates and expert foundation repair service. HD Foundations installs double pipe pressed steel piers in Dallas, Fort Worth, Arlington, Plano, Irving, and surrounding cities. Interior and exterior steel foundation piers are appropriate for concrete slabs as well as certain pier and beam foundations. Steel foundation piers can be pressed into the earth 35-75′ or more. That’s important because some houses in DFW (including Irving, Las Colinas and Valley Ranch) rest on very deep shifting clay soils. They’re durable and last for years. They can be installed relatively quickly. This method of foundation repair is good for stabilizing foundations that are subject to a great deal of movement. If you require residential service, you may want to review steel piers vs. concrete piers: Which is better? Depending upon how many pilings you need, these piers may be installed in just 1-2 days. The quantity of interior/exterior foundation piers that must be installed. How deep the steel piers must be pressed into the earth. The market price of steel when repairs are made. The charge for steel is constantly going up, so pilings can be costly to manufacture. 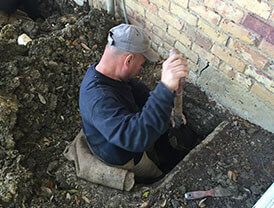 There’s a lot to consider when having foundation repair using pressed steel piers in the DFW metroplex. Whether you’re in Dallas, Fort Worth, Plano, Irving or Arlington, remember this: While steel foundation piers are somewhat expensive, they do provide excellent support. It’s wise to utilize these types of pilings when your structure is positioned on very deep soil that is highly unstable. If your foundation is experiencing only average movement, you may want to choose a less expensive option. To find out more, get a free HD foundation repair estimate online today and request a foundation evaluation. Or, if you want to know more about why property owners in Dallas the Fort Worth area choose steel pier foundation repair, call us. We service Arlington, Irving, Plano, and the entire DFW metroplex.